Mini-ITX motherboards have always been an interest for PC enthusiasts. These small form factor components have always opened up opportunities to PC builders who wants a powerful system, without the additional bulk. Unlike the past, where Mini-ITX systems only served a very niche market, this form of motherboard is also getting mainstream acceptance. It is also common to see motherboard manufacturers include Mini-ITX products in their product lineups. With the release of the new Intel Z390 chipset, ASUS launched their new ROG STRIX Z390-I GAMING Mini-ITX motherboard to entice gamers who wants to build a powerful mini PC. Does the small form factor bring any compromise to the ROG STRIX Z390-I GAMING motherboard? Let’s find out. Like many Mini-ITX Motherboard, the ROG STRIX Z390-I GAMING is cramped with features all across the board. However, ASUS decided not to compromise quality with size, and wanted to make sure that this motherboard will perform as well as any other full-sized offerings. Any premium motherboard of 2018 comes with RGB lighting. We aren’t sure if such a feature is actually required, but it seems that all manufacturers have that “scared to lose out” mentality, and therefore did not dare to leave RGB lighting out of their products. Thankfully, the RGB lighting on the ROG STRIX Z390-I GAMING is rather subtle, as the LEDs are placed on the underside of the motherboard. This can create an cool effect on the background of the motherboard, allowing the motherboard to be emphasized. It’s something that we can accept. Together with the launch of the new Intel Z390 chipset, Intel also released the new 8-core Core i9 9900K processor. Even though this new processor is only rated with a 95W TDP, it will draw significant power when overclocked due to its high core count. The motherboard’s power delivery system will then need to handle the high power draw from the CPU. Moreover, it should also have the capabilities to keep the temperatures low at the same time. That is why, ASUS has slapped a massive solid aluminum heatsink on the ROG STRIX Z390-I GAMING. This will ensure that the CPU will not throttle even when overclocked. This heatsink is also uniquely designed to be integrated with an I/O shield. It seems like such design is becoming a standard for premium motherboards. ASUS also has adopted a rather unique design for cooling the Z390 chipset. The heatsink that is placed on the Z390 chipset is also the same heatsink for the main M.2 slot. Despite being a Mini-ITX motherboard, the ASUS ROG STRIX Z390-I GAMING still comes with multiple expansion capabilities. Even though it’s technically not possible to have two M.2 slot on the main surface of the Mini-ITX motherboard, ASUS has placed a 2nd M.2 slot at the back of the motherboard instead. This really allows the motherboard be one hell of a performer, especially when the SSDs placed in these slots can be configured in RAID 0 mode. This will really bring about excellent storage performance of multi-Gigabit speeds. Moreover, this motherboard also comes with 4 x SATA 6Gbps ports, RGB headers and a USB 3.1 Gen2 motherboard header. As the adoption of the USB 3.1 Gen2 motherboard header is still considered low on today’s desktop cases, more so on Mini-ITX desktop cases, we would have rather ASUS bring the USB 3.1 Gen2 capabilities to the main I/O as an USB port. Else, we believe that this USB header will be left untouched most of the times. The ASUS ROG STRIX Z390-I GAMING is not perfect. In fact, we saw quite a number of less than ideal design points that could cause problems when building a system. Firstly, headers for the power switch/reset switch etc are placed above the main PCI-E x16 slot. This makes routing of the connecting wires awkward. ASUS tries to mitigate the problems by including an additional extension cable, but we thought that it would probably make more sense if their designers cracked their brains a bit more, and placed these headers at the sides/edges instead. This problem also affects the front panel audio and USB 2.0 headers as well. Secondly, the 2 x SATA ports which are located to the left of the RAM sticks are also rather oddly located. It would be difficult to route SATA cables out from these two ports. If cable management is a key consideration for your build, you may want ignore these 2 SATA ports, and just rely the other 2 that are on the sides. Thirdly, because of the rather large size of the VRM heatsink, there may also be possibilities of compatibility issues with tower-based CPU coolers. However, since this motherboard is meant for a small setup, we actually don’t expect the system builders to place a large CPU cooler on this system in the first place. We will be running the ASUS ROG STRIX Z390-I GAMING motherboard with the hardware components we have on hand to understand how well can this system perform. We will first look into the general performance of the system, then focusing on the CPU, Memory, Storage and dedicated GPU performance. On top of that, with our baseline results created from the stock setup, we will then overclock the system to see how much more performance we can achieve and sustain on the processor. We will also run a stability test to find out if the motherboard is able to sustain the load provided to the processor under overclocked scenarios. 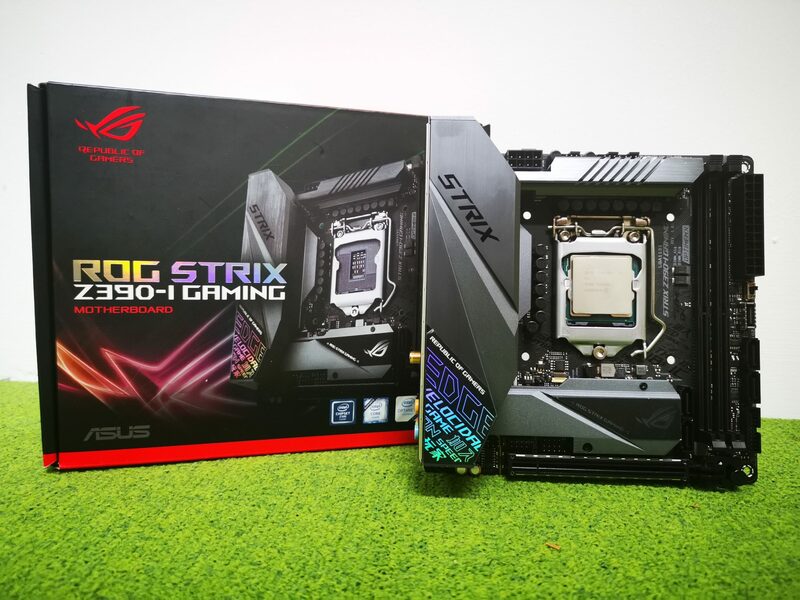 We will be testing the ASUS ROG STRIX Z390-I GAMING with IntelBurnTest to find out if the equipped heatsink on the motherboard is able to tame the heat generated from the VRM components, especially when the system is operating in an overclocked state. Since ASUS integrated their “AI Overclocking” capabilities on the ROG STRIX Z390-I GAMING motherboard, we shall give this new feature a try. IntelBurnTest is a program that simplifies the usage of Intel Linpack. Intel Linkpack is a stress test program for x86/64 CPUs that covers the CPU, Memory, Memory Controller, and other system components to their highest extend. With this software, we can understand if the system can be truly stable under extreme loads. By simply entering the BIOS on the motherboard, we were able to easily access the AI Overclocking feature, which is made available right even in the EZ-Mode. AI Overclocking on the Z390 ASUS motherboard actually works like a charm. Once we set the AI Overclocking mode to AI Optimized, the system automatically bumps up the Intel Core i7 9700K to 5.1GHz. The IntelBurnTest software also managed to continuously run on this configuration without any throttling, as the frequency of the CPU remained at 5.1GHz. We saw a massive power draw of more than 330W from the power when the program was executed. With a stable system, we also managed to run Cinebench R15 to see the performance differences between the stock and overclocked system. With an increase of Turbo speed from 4.9GHz to 5.1GHz, we saw a 5% increase of Cinebench R15 score. This is considerably good, as a raise in 4% clock speed managed to result in a 5% increase in score. If we were to raise the CPU clock frequency even higher, we would possibly achieve even higher returns. However, as the CPU reaches an alarming temperature when stressed even with a 240mm liquid cooling system attached, the further overclocking efforts will be very limited. At the same point of time, we also concluded that the power delivery circuitry and thermal design on the ROG STRIX Z390-I GAMING motherboard was capable of such overclocking situations. Therefore, there are no red flags raised in this area in terms of motherboard performance, and consumers can safely lay their hands on this component without any worry. Let’s take a further look at the overall performance of the system under various scenarios and tests. For our performance tests, the system will be running at stock settings with XMP for the memory kit enabled. PCMark 10 provides organizations with a complete assessment of system performance beyond typical office work tasks. It also includes demanding graphics and physics tests that focus on GPU and CPU performance. PassMark PerformanceTest benchmarks a PC performance using 32 standard benchmark tests in five test suites. The results from the overall system benchmarks tells us that the ASUS ROG STRIX Z390-I GAMING Motherboard is capable of supporting the latest hardware components and producing high performers. We saw that the PCMark 10 and PassMark benchmark places the system at top spot with other high-end systems. CINEBENCH is a real-world cross platform test suite that evaluates your computer’s performance capabilities. CINEBENCH is based on MAXON’s award-winning animation software Cinema 4D, which is used extensively by studios and production houses worldwide for 3D content creation. 7-Zip is a free and open-source file archiver. The benchmark determines the speed of the system compressing and decompressing of archives with LZMA methods. The CPU benchmark tests the system with real world applications. The motherboard was able to support these applications well, and there were no signs of throttling when the CPU is stressed. AIDA64 is a system information, diagnostics, and auditing application developed by FinalWire Ltd. It includes a memory benchmark test which shows the system’s memory latency and speed. The memory benchmark on AIDA64 also shows that the RAM installed on this system are running at full speed as expected, and that there are no red flags raised when it comes to memory performances. CrystalDiskMark is designed to quickly test the performance of your hard drives. Currently, the program allows measuring sequential and random read/write speeds. ATTO Disk Benchmark is a widely used software used to measure storage system performance. It runs various read and write tests with different test data to see performance of the disk under different scenarios. The AS SSD benchmark determines the performance of Solid State Drives (SSD). The tool contains six synthetic and three copy tests. The synthetic tests determine the sequential and random read and write performance of the SSD. These tests are performed without using the operating system cache. In the sequential test, the program measures how long it takes to read and write a 1 GB file. In the 4K test, read and write performance is determined for randomly selected 4K blocks. Similarly for the storage tests, we were able to see our SSD run at its expected speed. 3DMark Time Spy is a new DirectX 12 benchmark test for Windows 10 gaming PCs. Time Spy is one of the first DirectX 12 apps to be built “the right way” from the ground up to fully realize the performance gains that the new API offers. With DirectX 12 engine, which supports new API features like asynchronous compute, explicit multi-adapter, and multi-threading, Time Spy is the ideal test for benchmarking the latest graphics cards. The Final Fantasy XV Official Benchmark application gives a score to indicate the level of performance you can expect from a PC system when running FINAL FANTASY XV WINDOWS EDITION. It does this by displaying several of the events, maps and characters used in the game. With our setup, the system reaches a “High” result. This means that this system will run the game smoothly. The system manages to achieve a score of near to 25,000, which means that it will handle the game without any problems at all. When it comes to more graphics intensive games, we saw the GTX 1070 falter to meet expectations when the games were set to the highest possible settings. However, the system was able to complete the benchmark without any issues. The motherboard was able to handle the different components well and produce a stable and workable system. The ASUS ROG STRIX Z390-I GAMING motherboard performs very well for its size. The motherboard’s AI overclocking capabilities captured our attention, as we didn’t know that overclocking a system can be that easy. Moreover, rather than just making sure that there was an increase in clock speeds, the AI overclocking feature was even able to result in a fully stable system that was able to run through stress tests. That’s impressive. Moreover, the motherboard was very stable throughout all the tests, and there were no signs of CPU or VRM throttling due to thermal issues. However, while we had no doubt of the performance of this motherboard, ASUS had to settle with some awkward design decisions due to space constraints. Nonetheless, if you are looking to build your next Mini-ITX gaming machine, we would recommend the ROG STRIX Z390-I GAMING motherboard. Rainbow Six Siege gets even more content with "Operation Wind Bastion"
The Crew 2's Demolition Derby update is now here!